My daughter's birthday party was Sunday. 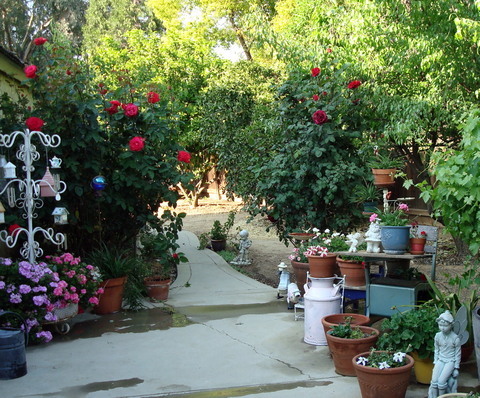 Her hubby and mother-in-law cooked a wonderful lunch of shish kebab, a middle eastern salad and other yummies. You all were right when you guessed that I made her an apron. I wish my picture had turned out better. Some times my camera plays tricks with me. I think it's possessed. Could be the operator though. The party was fun. My son-in-law's one year old twin nephews stole the show though. They even serenaded us. They are so adorable and so sweet! I wanted to take them home. Yesterday was a real treat too! I met Amy at Abundant Curiosities almost a year ago. 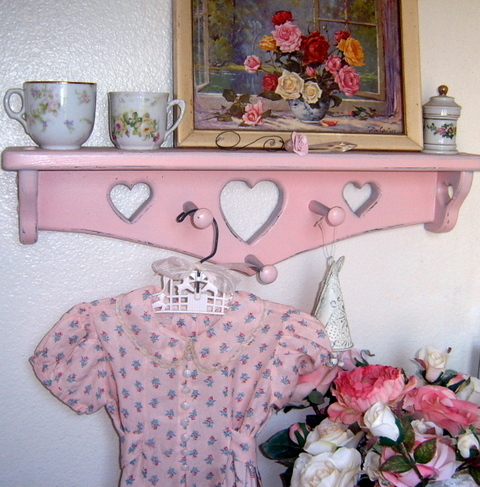 She was reading my blog and I said I was looking for a little hanger for this cute baby dress. Amy had one and sent it to me and we began a friendship through email and our blogs from 3000 miles away. Who would have thought that we would ever get to meet in person? 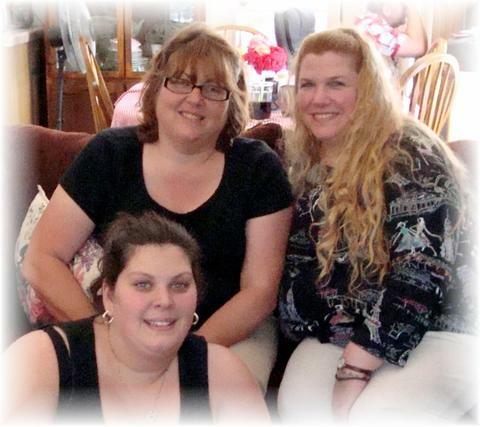 Well this week Amy is visiting California from Ohio and yesterday her sweet sister-in-law drove her down to meet me. We had a nice lunch and then Amy came over to my house. I showed Amy where I make my messes art. My daughter dropped by on the way home from the dentist (Poor baby) and was able to meet Amy too. 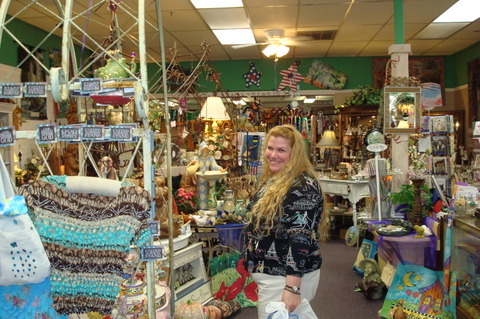 Then my hubby and I took Amy and Sue to visit Old Town Clovis and hang out in some of my favorite stores. Amy is so sweet and cute! We had to laugh because Amy and I were both wearing black tops, khaki capris, black headbands and even our wedding rings were almost identical. We had such a good time. I really felt like I had known Amy forever. There weren't any awkward silences and I didn't want her to leave. We'll have to plan a trip back east one of these days. She might be all grown up. She might have a great job. She might be married to a great guy and live in a big, beautiful, new house. Tomorrow she might be turning 24. 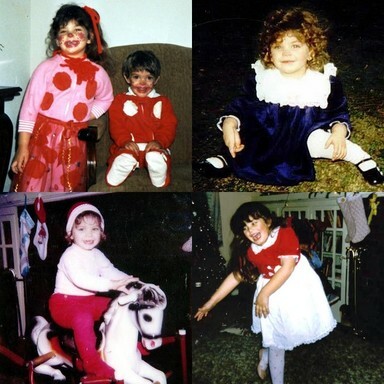 But, she'll always be my little girl. Want a sneak peek at what I've been working on for her this week? Can you guess what it is? Please, go wish her a Happy Birthday. Tell her that her mom sent you. 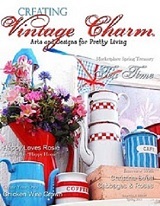 Will Swap 4 Pretty Stuff! I promised you a look at my recent swaps. I was lucky enough to participate in Heather's Junque in my Trunk Swap! Sonya at Love of Yellow Roses was my swap partner. 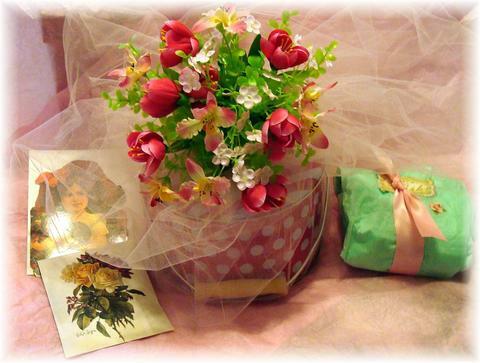 Heather asked us to make our package look as good on the outside as on the inside. I was concentrating so hard on making it look pretty that I completely forgot to take a picture of the contents of this cute polka dot can that I covered with tulle and flowers. You can see what's inside when you visit Sonya. 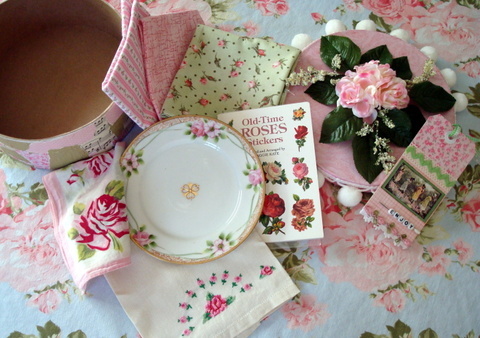 Sonya sent me this pretty hatbox that was filled with my favorite things, pretty fabric, a beautiful porcelain plate, a rose cross stitched tea towel, pretty post cards, rose stickers and a beautiful tag. 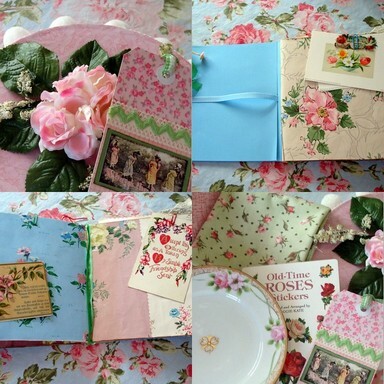 I love every single thing she packed into that pretty little hat box. Thank you Sonya! 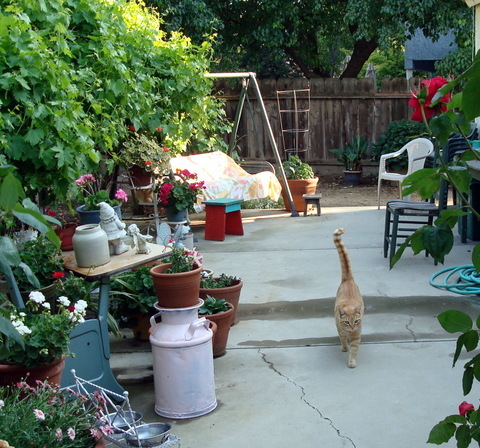 One of my favorite blogs to visit is Gathering Dust by Beth Leintz. 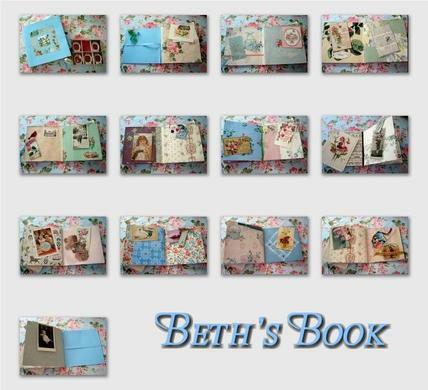 Beth is an artist for the Vintage Workshop and does beautiful collages. Beth mentioned that she had not been able to find shams for her guest room and I "volunteered" to make her some. Beth wanted to pay me, but I told her I'd rather have a piece of her art. 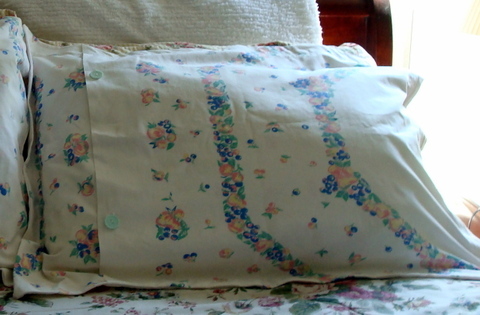 She sent me three vintage tablecloths and I turned them into these shams. I was just thrilled that Beth liked them. 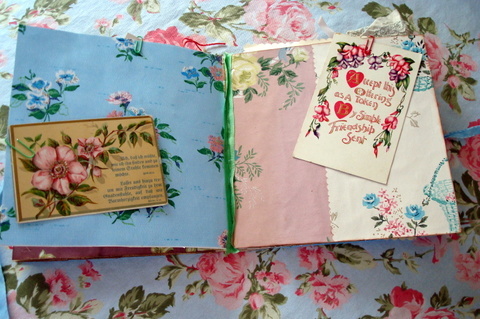 In return, Beth made me the most beautiful book. 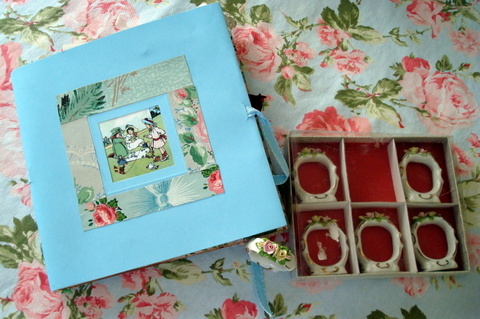 She used bits of ephemera, vintage wallpaper, postcards, ribbons, trims. Oh my!! As if that wasn't enough, she sent me a box of vintage Dresden napkin rings. I love anything Dresden and they match some candlesticks that I already have in my china cabinet. 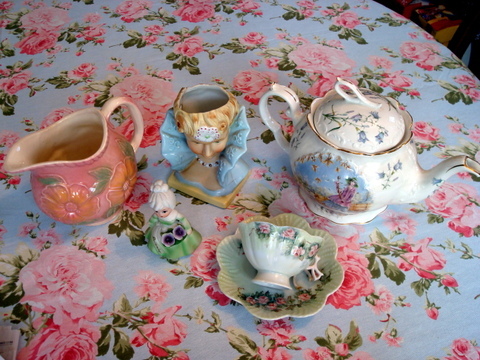 I'm going to have to have a tea party soon so that I can show them off. 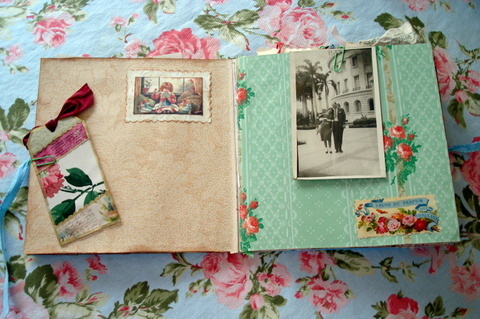 This book is just fabulous and it will be one of my most treasured heirlooms. Who knew blogging would be so fun and rewarding. Finding kindred spirits, discovering wonderful artists!! I'm making a new sign- I'll swap for Pretty Stuff!! This week's Show and Tell is hosted by Cerri. 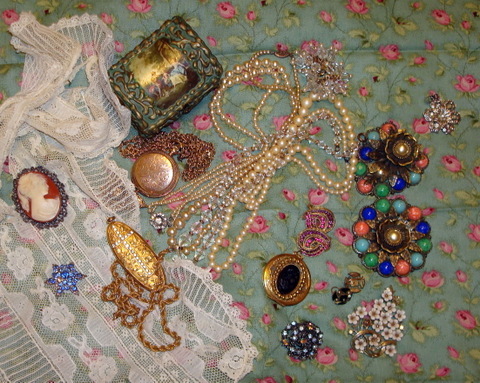 It's all about vintage jewelry. The brooch below sits on my desk in a little bowl. It is my favorite rhinestone pin. 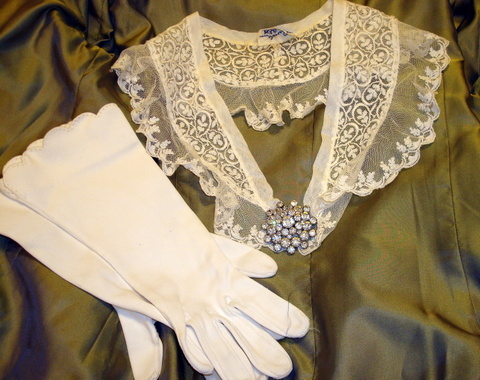 I love it against this vintage lace collar. 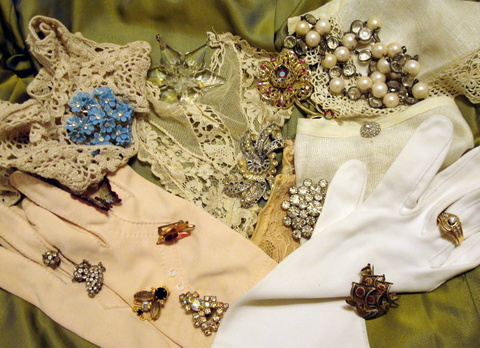 Here are a few with some more of my lace collars. 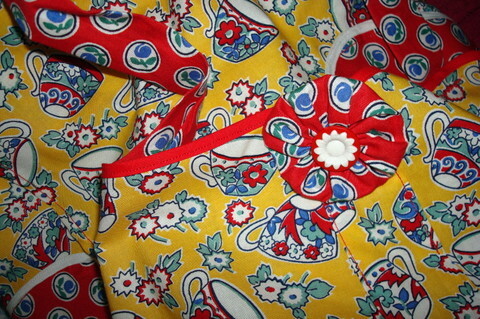 You can view more of my vintage collars on my flickr. The center diamond on my wedding ring is over 100 years old. It was in my grandmother's engagement ring and I asked my hubby to have it set in my ring on our fifth anniversary. The oval gold locket with the rhinestone cross belonged to my great grandmother. I've been telling my daughter that I would get it out of the safe to give to her. Next week is her birthday. I think it's time to pass it down. 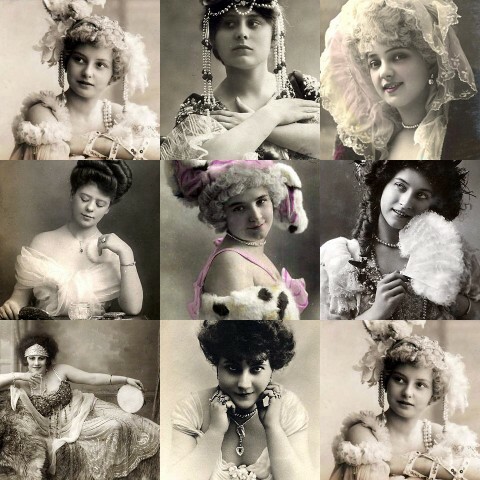 I've never dressed up like the ladies in this picture. But once in a blue moon, I have a hot date with hubby and I actually might wear some of my bling. 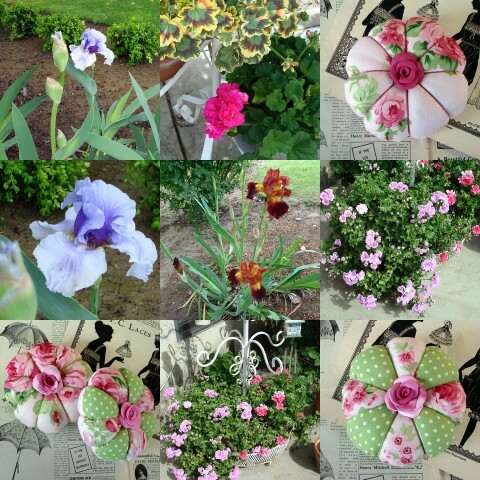 I am having fun visiting all of the new (to me) blogs through Show and Tell Sundays. Analise and Cerri must be the teacher's pets by now! Come back in a few days. I can't wait to show you my two swap packages. Oh my!! I want to thank all of you for your questions and concern about my mom. The last few days have been the best since she came home. Two days ago, I would have told you a much different story. Yesterday was the first day that she actually got up, dressed and stayed awake all day. It is the first time since she came home from the rehab hospital that she has shown any gumption. I have been at my wit's end trying to stir up a spark in her. I am hoping this is a permanent change. It is hard to see someone sit waiting for life to be over. And that is exactly what she was doing. So, now you know. That's why I spend a lot of time outside with the cat. He follows me around while I play in the dirt. 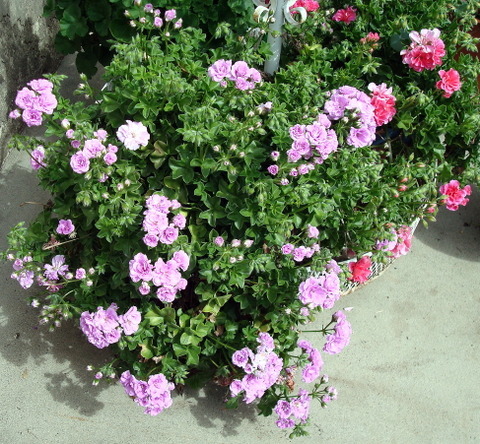 I planted petunias in pots and transplanted some geraniums. 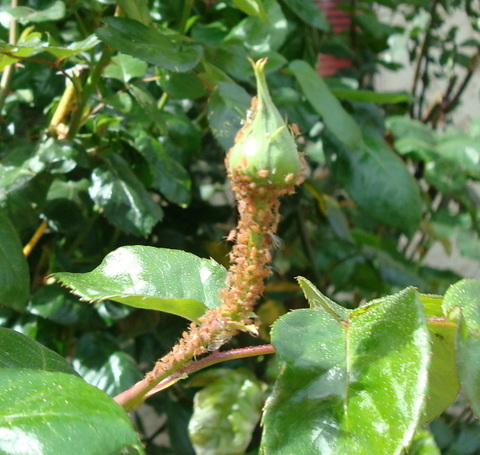 I think I have won the war with the aphids. I'm crossing my fingers. I also hide behind my sewing machine, a lot. 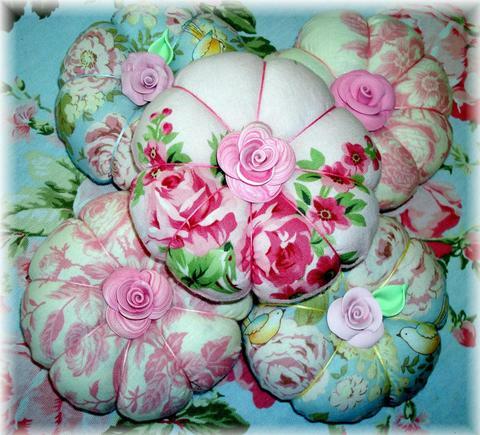 I added some new pincushions to my Etsy. 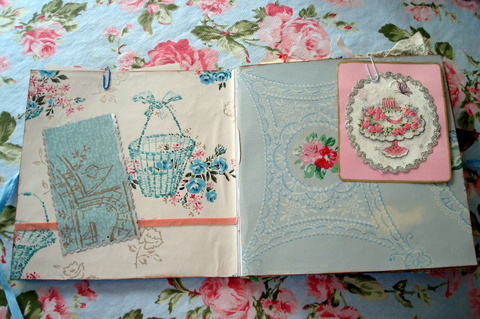 I found the prettiest fabric with flowers and little birds on a blue background. 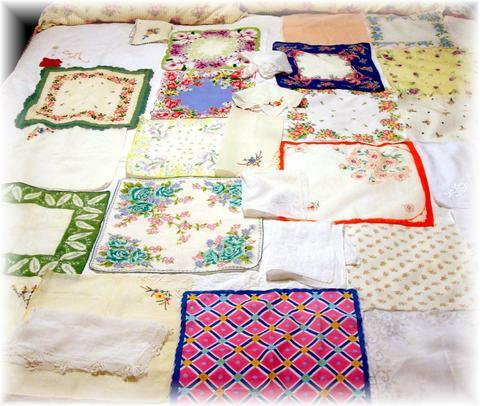 And now, I have a new project, a hankie quilt. I'm not really sure how to make one. If anyone has one, I'd love to see it. 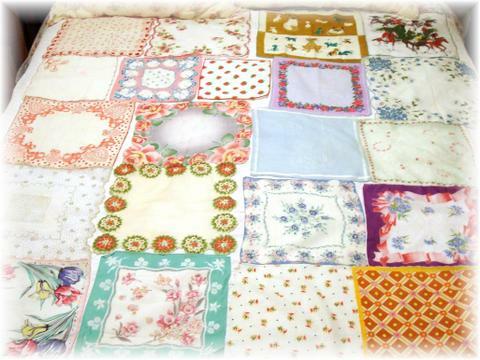 Some of my hankies have beautiful edges and I'm not sure how to sew them into a quilt while leaving the edges intact. Despite thinking that I have way too many collectibles I bought another doll. 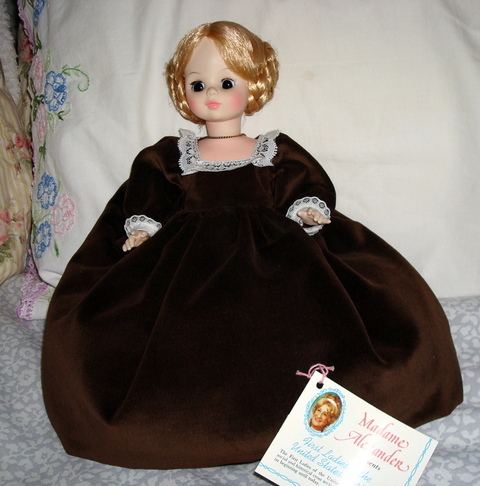 I couldn't resist this Madame Alexander doll for $20. at an estate sale. Oh my, you should have seen that collection! I'm not sure that I made a good buy. I didn't realize until I was home that she is made of plastic. 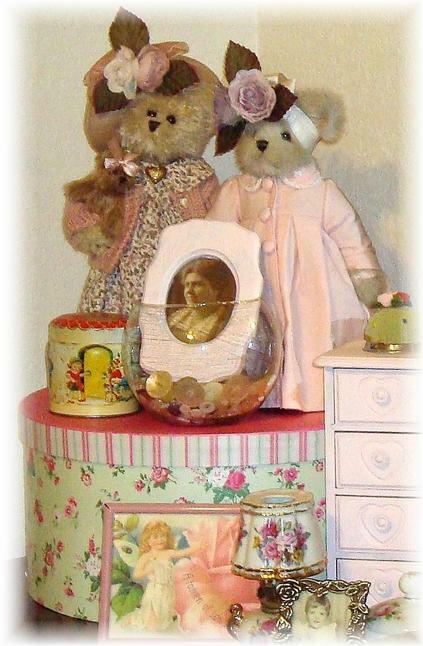 I told my daughter and son-in-law that I am starting a collection for my future grand daughter. Was that a subtle hint? This week, Analise is hosting Show and Tell Sundays and the theme is handkerchiefs. 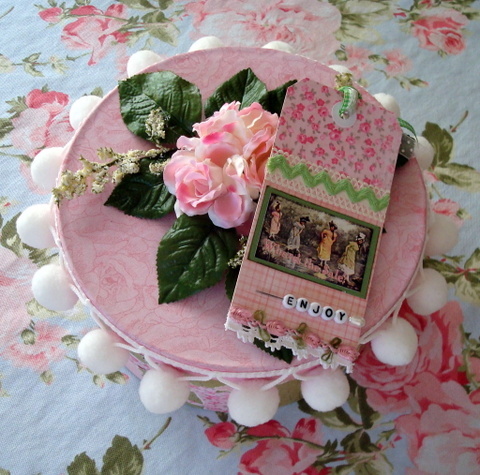 Do you remember this hat box from last Sunday's Millinery Show and Tell? Did you wonder what was in it? 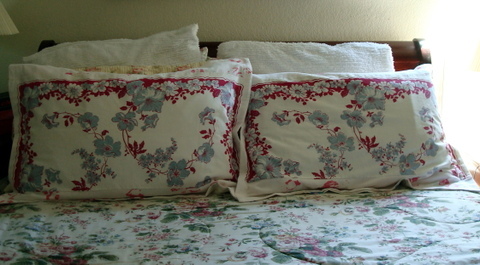 Inside are some of my favorite linens including my hankies. 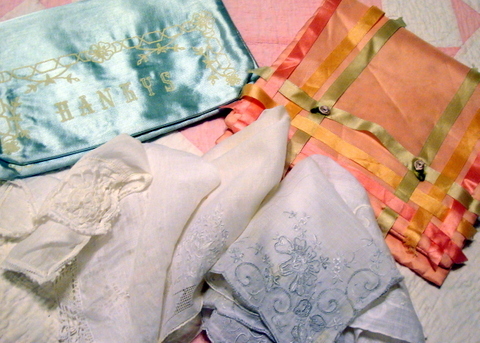 When I heard that this week's theme was hankies, I thought I might have a few to share. I had no idea that I had over 50. 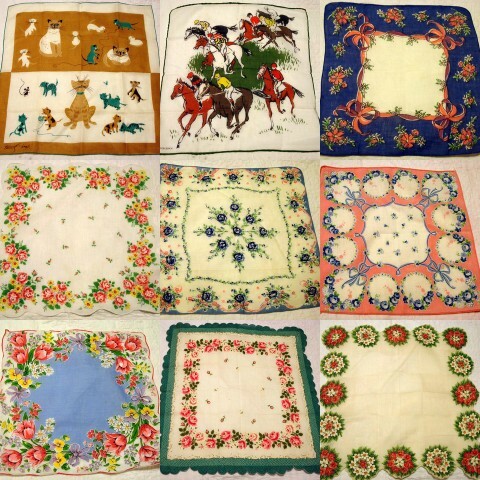 Hankies are a great collectible. 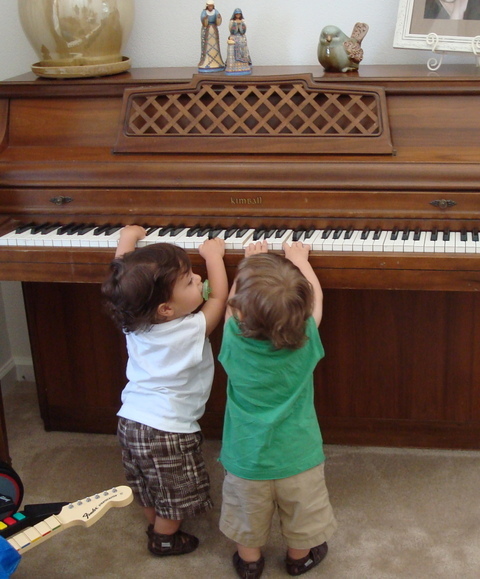 They almost always cost only a few dollars at the thrift store or estate sales. 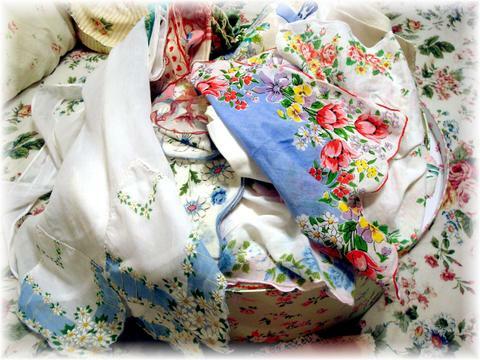 I didn't think that you had time to look at 50+ hankies so my hubby helped me lay them out on the bed...twice. These are a few of my favorites. 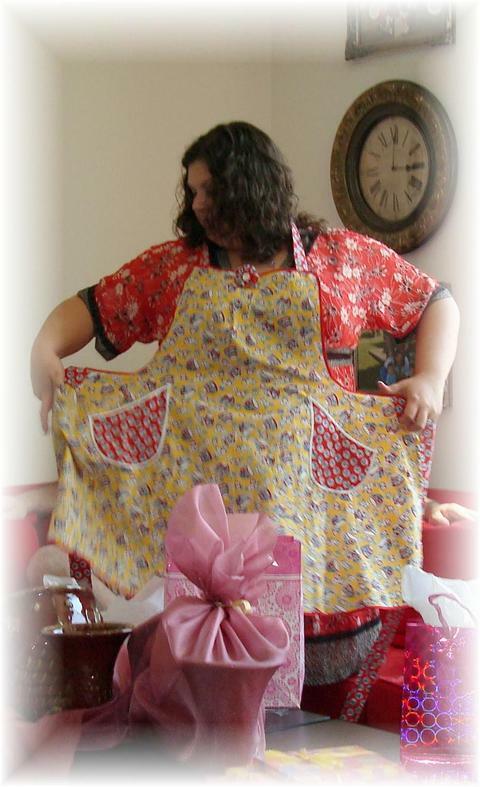 I also collect aprons and this vintage apron was accented with a handkerchief. 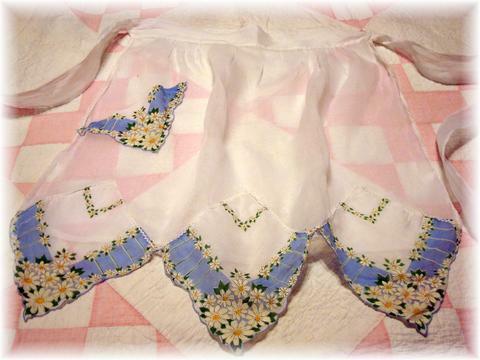 Here are two pretty handkerchief holders and some white on white embroidered hankies. 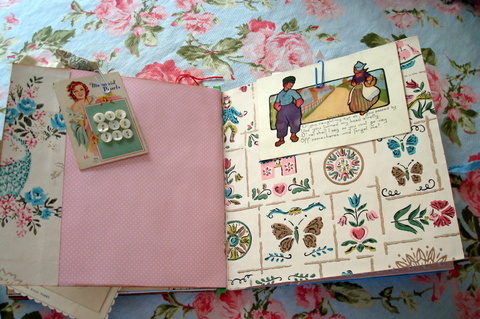 I like to use handkerchiefs to add a touch of vintage to my sewing projects. 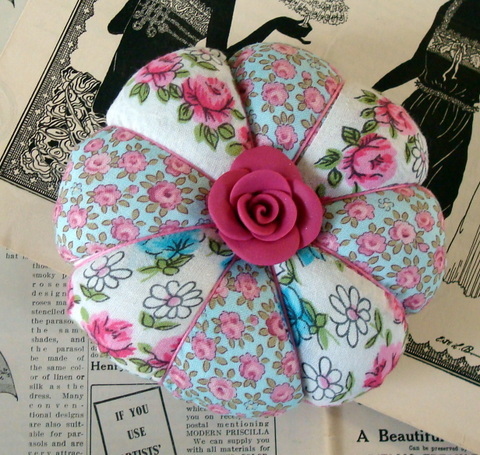 I cut up a handkerchief and used pieces of it to make this pincushion which is on its way to Belgium. Thanks for stopping by and looking at my collection. I also want to thank Analise and Cerri for hosting these fun Show and Tell Sundays! I know I already posted today. I don't think I've ever done two posts in one day. But, I was so excited about my estate sale finds. I had to show you what I found. My daughter and I drove up to this old run down house behind a chain link fence. We almost didn't go in. I knew the sale was being run by one of the more reputable antique dealers in town so I convinced my daughter to go in. Talk about not judging a book by it's cover. 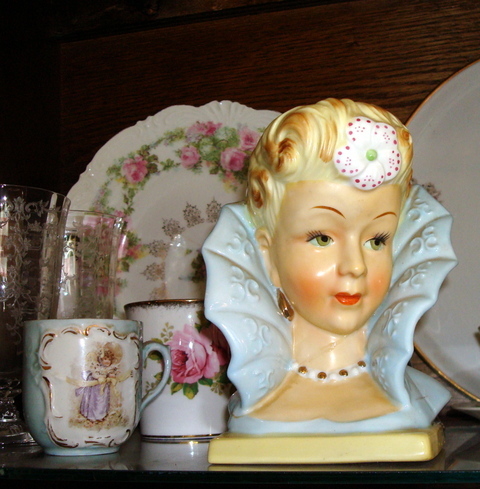 This house was full of porcelains and beautiful antique furniture. No hankies though. I brought home these beauties pictured above. 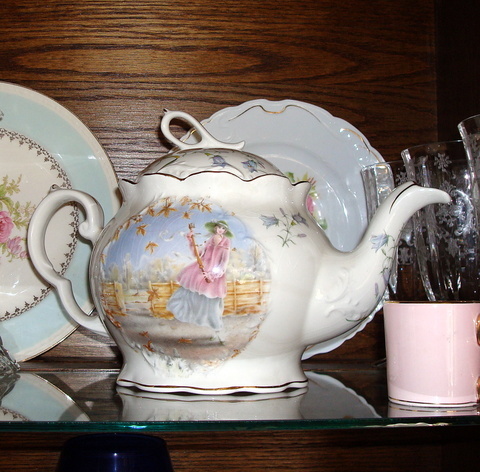 The tea pot was a splurge at $15. The pitcher was $8 and everything else was a dollar. The beautiful head vase is very badly cracked but I knew it wouldn't show inside my china cabinet. I think she might be the prettiest one I have ever seen. Now, I've got to get away from this computer. 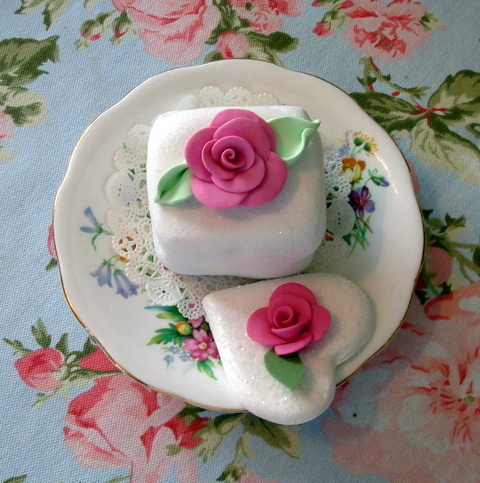 I'm working on little cakes for my Etsy shop. 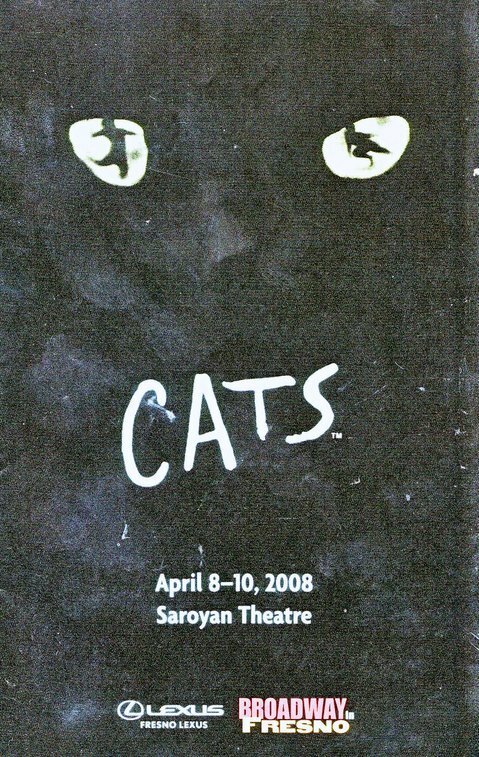 Cats was absolutely wonderful! Tricia Tanguy played Grizabella and she was amazing. Her performance of Memories sent goosebumps up and down my spine. It was a great way to end the day. If I were a character in Cats, I would have been named Grumbletiger after my hearing at the Department of Motor Vehicles yesterday. The hearing officer asked me questions about my diabetes. Some of them I felt were none of his business. He even asked if I exercised. I do. I walk for 45 minutes to an hour almost every day. He was overweight and I wanted to ask him if he exercised. What my exercise habits had to do with being a safe driver I have no idea. He informed me that I will have to come back in six months and show him that my blood sugar levels are at 120. Normal for a non-diabetic person is 80-120. I guess I will have to magically rid myself of diabetes. I asked him about his medical background. He had none. I am angry that the DMV is making arbitrary decisions about my right to a driver's license. I have not had an accident or ticket in over 25 years. I am knowledgeable about my diabetes and know when I shouldn't be driving. If there are any diabetics reading this and have information to help me, please let me know. 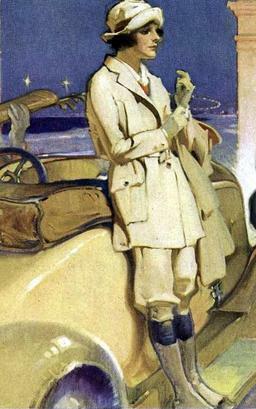 I'm done grumbling now and I am off to an estate sale. Sunday's Show and Tell will be about handkerchiefs. I'm off to add to my hankie collection. If you've been reading my blog for very long, you'll know about my ongoing fight with the Department of Motor Vehicles to keep my driver's license. When I renewed my license in December, a red flag was raised when I notified them that I take insulin. I have had three eye tests, two doctor's visits and now I have to go before their mucky mucks and plead my case. Today is the day. Please think positive thoughts for me. Tonight, I'm going to see Cats with two of my best friends and my daughter. I'll tell you all about it tomorrow.